Don't forget: Only one week until our Love My Library link-up on May 12! I'm blessed to have both of my girls' grandmothers in town, so I had two opportunities to make Mothers Day gifts: a beaded bookmark for my bibliophile mother, and this cute garden apron for my green-thumbed mother-in-law! I am not an artist, but this apron is so simple, even I could pull it off. I started with a craft apron from Michaels and painted the grass using two shades of acrylic green paint. Then it was time to paint my girls! ... A turned Picasso while I had stepped out of the room. I was upset at first, but managed to squelch my perfectionist tendencies. I figure Grandma won't mind. Overall I'm really pleased with how it turned out and hope she is too! On a different note, did you know that this is the 60th anniversary of Are You My Mother ? I'm always saying there's a reason this or that book is still in print so many decades later. Are You My Mother is a classic that deserves to be on every child's bookshelf. It was the very first book E read by herself (at age 3!) and we will continue to enjoy it as A gets older. So pull out your old copy or grab one from the nearest library and enjoy one of the best "mother" books this Mothers Day! The apron came out so pretty. My favorite part is the butterfly (feet), adorable. Thanks so much for another great idea! Beautiful apron! LOL about the size of the thumbprint. I'm sure your mother-in-law will love it. I love the footprint butterfly! 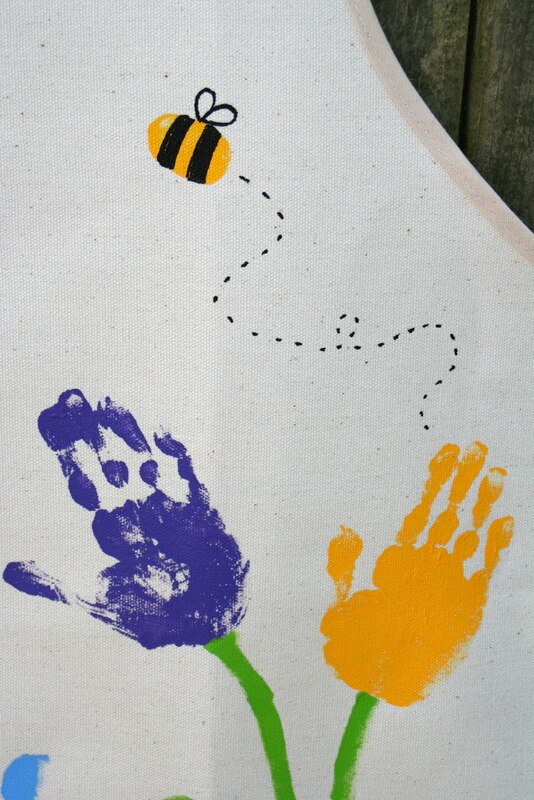 A girlfriend once made me a canvas tote bag with hand-print flowers while my son was at a playdate at her house! Hey! I just wanted to let you know that we made our apron tonight, and I think my MIL is going to love it! Thanks so much for the darling idea! The apron is absolutely adorable!! Great work!! Awesome! I love the idea to turn a handprint project into some usable. Get it off the page and onto the cook! Oh, now this is absolutely adorable!!! I love anything with handprints. Thanks for sharing ... I've posted a link. Hi! I'm a newbie to crafting so I was wodnering did you use acrylic paint for the hands and feet as well??? Does it wash off easily? Thanks. Looks wonderful appreciate you sharing. 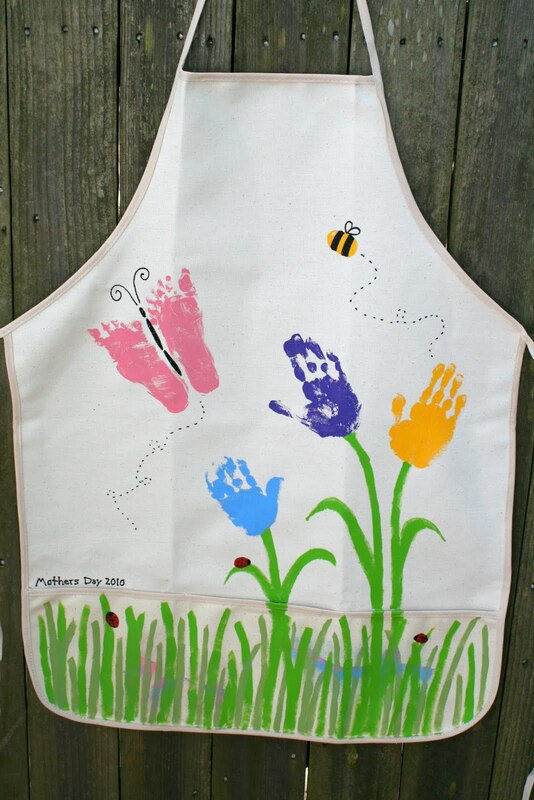 I got one of these apron last Mother's Day. I love it. I wear it everyday at work. Hello! What type of paint did you use for it to stay after washing the apron? Was it only acrylic? Or, whish others work well? If you have other kid-friendly crafts, we'd love it if you would submit them. If you would like to display a featured button on your site, you can grab one from the right side bar of your post above. Thanks for a wonderful project idea! I'm a kids lit junkie and mom of two girls: E (9) and A (6). Come join us as we discover the best children's books available and explore related crafts and activities!